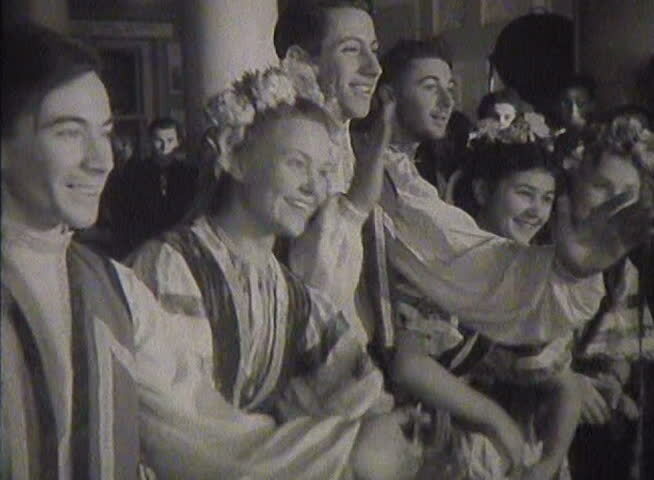 FORMER U.S.S.R. - CIRCA 1950-1960: Newsreel Soviet Union, dances at the festival. sd02:34CIRCA 1950s - A state representative presents a highway proposal to a small 1950s town full of upset citizens who want a highway running through the town. sd02:041930s - Party goers are disciplined in the aftermath of a beach party gone wrong, 1930s. hd00:17Children enthusiastically looking cheerful cartoon in cinema hall. Young father with his doughter. Black and white shot.